Here is a list of local outdoor pools open during the summer months – culled in 2012 by Shelby Hansen and passed along to Emily Parks who graciously shared it with us! It would be wonderful to have full posts for each one of these. If you go to one we haven’t already covered, please consider sending us a trip report. Thank you! Fussa Pool (first week July – first of Sept) Open Daily. 9am-6pm. ¥200 for HS age and up, ¥100 for MS age and younger (2 hrs). Free parking available. Features: kid’s splash pool, simple water slides. Rainbow Pool (Showa Park) (Mid July – first of Sept) Open Daily. 9:30am-6:30pm (only ’til 5:30pm weekdays in July, only ’til 6pm daily from 8/20 on). 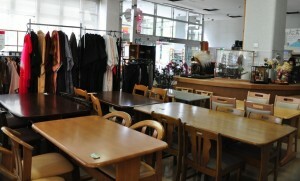 ¥2,200 for HS+, ¥1,200 for ES/MS, ¥300 yen ages 4-5, 3- free (¥500 maternity price) (full day price). 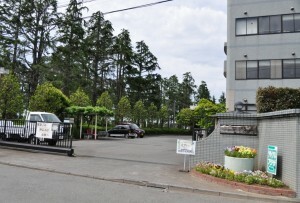 Parking available (¥800/day) (A free Park bus can take you to the pool from the Sunagawa or Tachikawa Park entrances). Features: multiple kid’s splash pools, lazy river, wave pool, water slides (for 120cm+; yellow one is for smaller kids), concessions. Discounts on admission for paying by SUICA/PASMO (minus ¥400 for HS+), or smaller discount just for showing SUICA/PASMO (minus ¥200 for HS+). For more information: Showa Kinen Park: Rainbow Pools. Higashi Yamato Pool (Mid July – August 31). Open Daily 10am-6pm (only 1:30pm-6pm 7/17-20) ¥300 for HS+, ¥100 for MS, ¥50 for ES, free for 5 and under (2 hrs). No parking (though the Ito Yokado store next door has a free parking garage…and a Baskin Robins). Features: kid’s splash pool, lazy river, water slides. Driving directions to Higashi Yamato Pool: Go right out the east gate, turn LEFT on the 7 and go 6 km, at Imokubo Hwy turn LEFT (the large blue sign points to Imokubo, the street name is Sunagawa Nana-something), go through the tunnel under the train station and turn RIGHT at the light, come to a T intersection and turn LEFT. The pool will be on your right and they do have free parking! Fuchuu Miyoshi Mizuasobi Hiroba (Splash Pad near Tama Hills) (late July – August 31) Open for three blocks each day 10am-12pm, 1pm-3pm, 3:30pm-5:30pm (some closures during open season) ¥160 for adults, ¥100 for HS, ¥40 for MS- (they may charge half this if they don’t ask if you’re a city resident). No parking. Features: splash pool, simple water slides. Swim Diapers OK.
Fuchuu Kyodo no Mori Pool (near Tama Hills) (late July – August 31). Open Daily 10am-5pm. 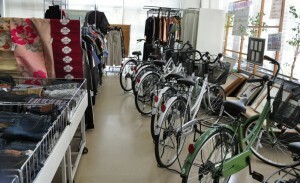 ¥300 for adults, ¥200 for HS, ¥100 for MS- (2 hrs) Parking available. Features: kid’s splash pool with slides, lazy river, water slide (for older kids). Inagi Pool (near Tama Hills) (mid July – August 31) Open Daily. 9:30am-5pm. ¥200 for adults, ¥50 yen for kids (2 hrs). No parking. Features: kid’s splash pool, simple water slides, lazy river. 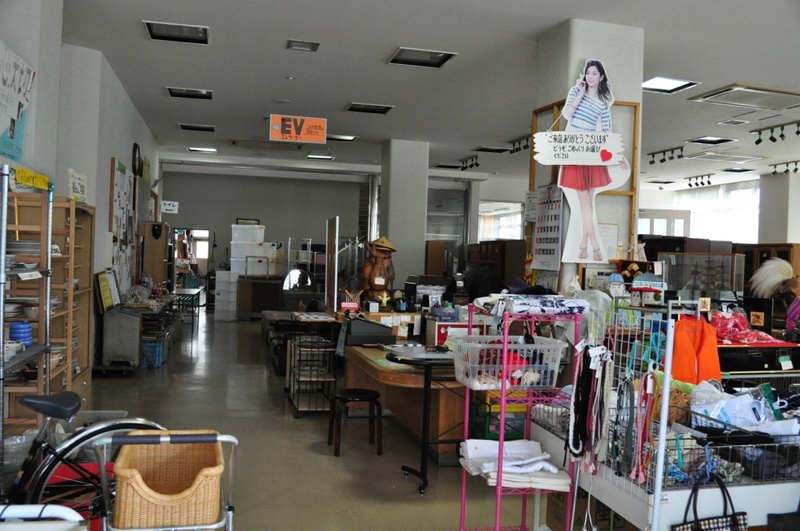 The Fussa Recycle Center is a small second hand store about 10 minutes from the East Gate. The building is an unassuming silver warehouse located down a quiet country road. There you’ll find a small display of dishes and decorative items, a number of bicycles, a few clothes, and a large selection of wardrobes, desks, and tables. 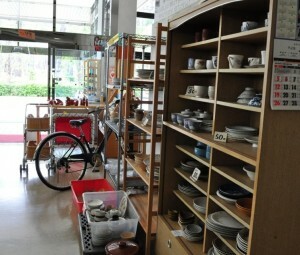 The prices are excellent, with dishes in the ¥50 range and most of the furniture ranging from ¥2500-¥7500. 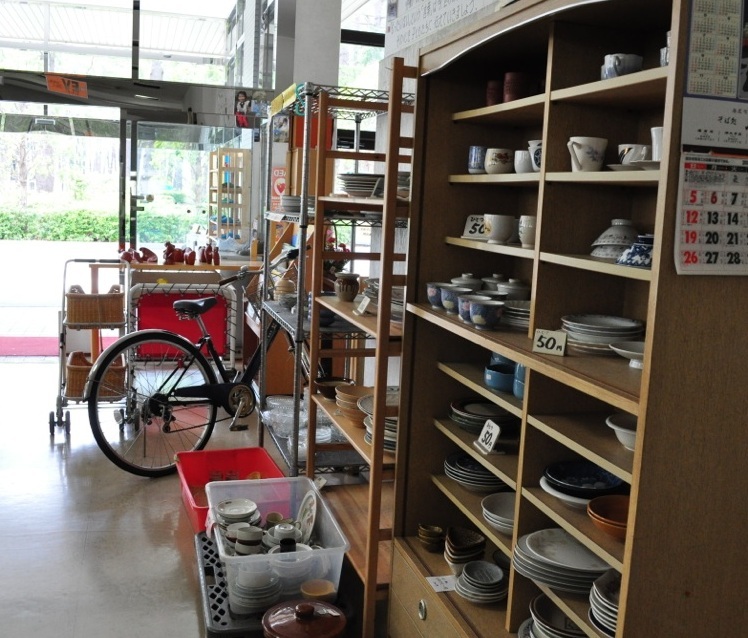 It isn’t the largest thrift store in the area, by far, but it’s a good place to look for bicycles and furniture, and — when I was there, at least — a lot of metal shelving perfect for use in the tower storage sheds. Open daily (I think daily) 10am – 4pm. GPS Coordinates: 35.736341,139.356959. DIRECTIONS: To get there, take a right out of the East Gate, then take the first right, at the stoplight. Continue down that road until you are just about even with the base hospital on your right, when you’ll see a little country road on your left. Follow that road past some fields until you see a big gray building on your right; that’s the Recycle Center. Go through the little gate and park in the lot, there. (If you miss the final left turn, don’t worry; the road will curve to the left alongside the base, and the Recycle Center will be on your left instead of your right. Just follow the road around the building and take a left, then an immediate left into the parking lot.) When you arrive, you’ll be expected to switch out your shoes for a pair of slippers in the atrium. 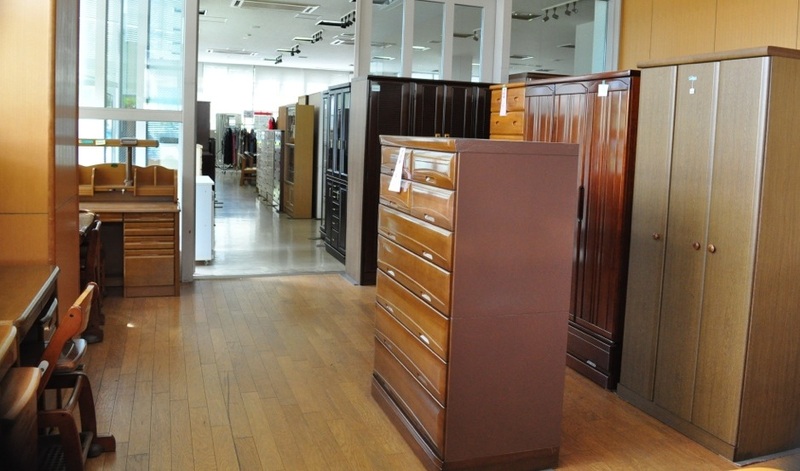 An elderly gentleman seems to run the place, so be sure to be on your best Japanese manners. Scroll down for more photos. – Roxanne Ready, May 2013. 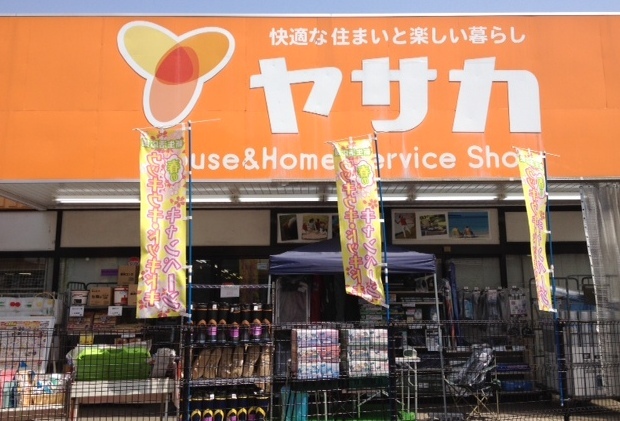 I call this place “mini Joyful Honda.” It’s a great garden and home improvement center that is even closer to base than Joyful Honda. I go here if I just need a few things and don’t want the hassle of the Joyful Honda parking and that whole overwhelming experience. 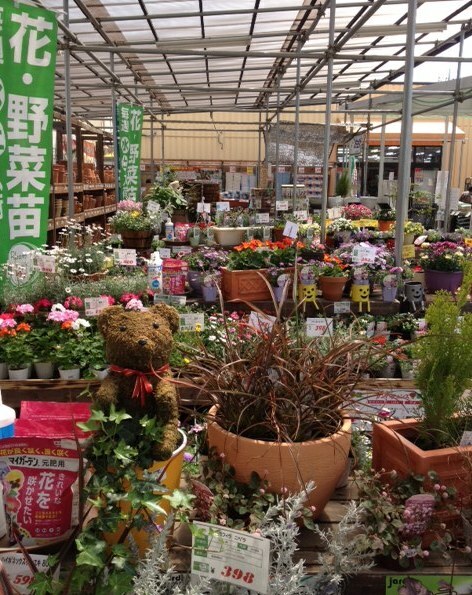 This place is called Yasaka and it has a great garden center with lots of plants and flowers. 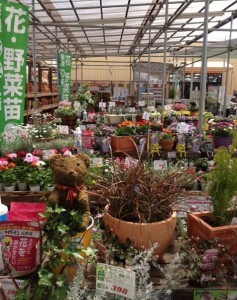 They sell potting soil and pots and anything you would need for your summer garden. They even sell some outdoor furniture, grills, etc…pretty much anything you would find at a small home improvement store. You would never find it from the main road since it’s pretty hidden on a small side street. My Japanese friend showed me one day. DIRECTIONS: It’s actually right near the Seiyu. 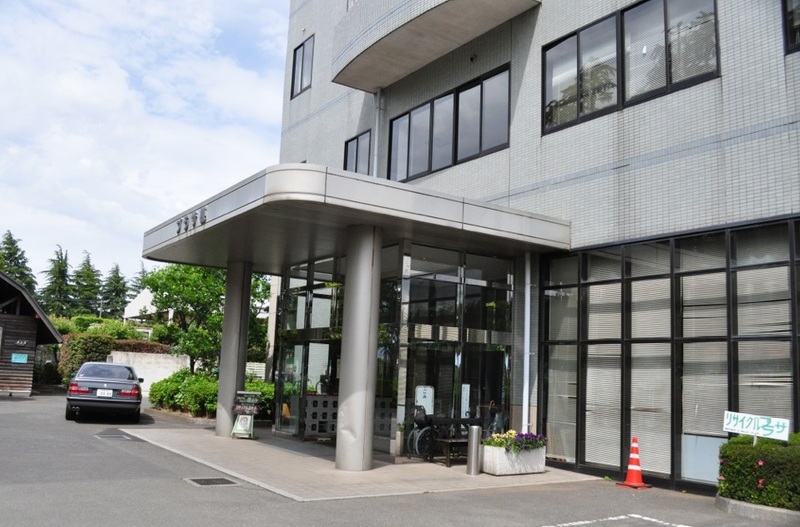 Just go past the Seiyu parking lot (overpass) and continue for 4 street lights. You will see a blue P “parking” sign on the left. Take that left turn and then an immediate right onto a very narrow (blind spot with mirror) road and it is right there. There is ample free parking right across the street. GPS: 35.747497,139.324443. – Kelly O’Donnell, May 2013. Running/Biking DIRECTIONS: Head straight out of the Fussa Gate toward the Fussa Train Station on Route 165. You’ll take Route 165 all the way to the river and trail. Be sure to stay right at the fork in the road, pass over the train tracks and continue down Route 165 after the Fussa Train Station. The trail picks up in both directions just before you cross the river. Turn right on the trail towards Hamura for the short section of the trail (just a few kilometers). Turn left on the trail for the longer section. DIRECTIONS to parking lot: Turn left out of the Fussa Gate onto Route 16. Continue on Route 16 as it curves right. Turn Right onto Route 7. (Note: I’m not sure how clear this right hand turn onto Route 7 is… if anyone finds a clear marker for this turn, let us know). Turn left into the parking lot area just before Route 7 crosses Tama River. This is a small roller slide park, great for an hour of play just outside the supply gate. 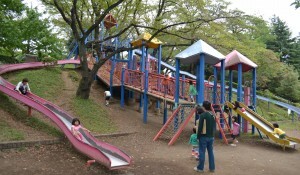 There is a play structure leading up to two roller slides. Tall cherry trees provide shade. Above the slides there is a nice place to sit and eat a snack. There are bathrooms. GPS 35.73433, 139.33611. Directions: One option is to park on base at the supply gate and walk. The park is just 600 meters from the gate with sidewalks on either side of the street. Head straight out the Supply gate onto 7. Continue across the train tracks and turn right just after the blue pedestrian bridge. The park will be on your right. If you drive, follow the same directions as above. I’ve seen people park along the street in front of the park, however, for parking information see the comments below. -Sarah Straus, October 2012, updated Dec 2013. 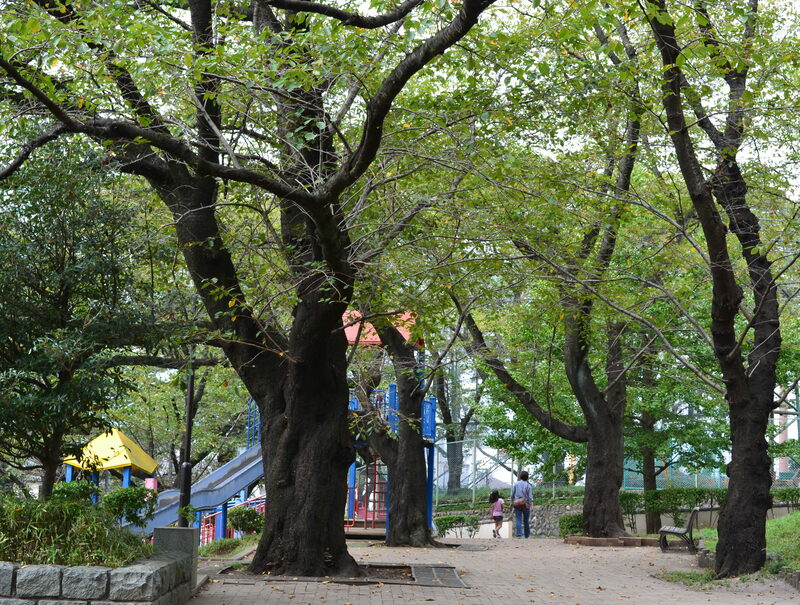 Looking for another playground in Fussa? 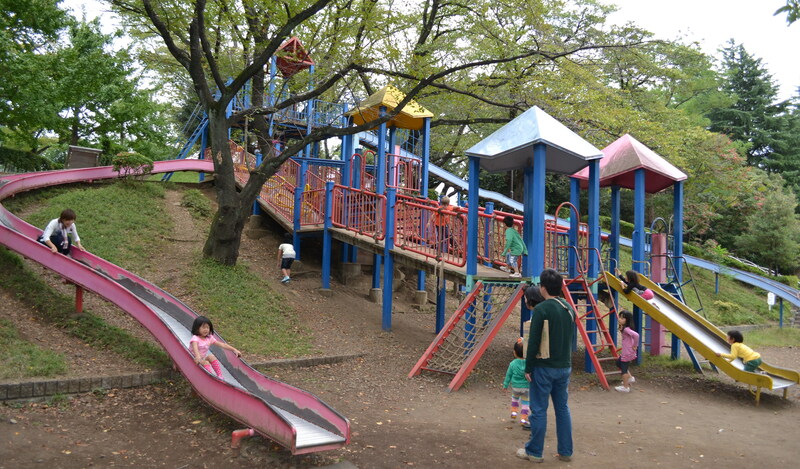 Try Fussa Playground. Start at the Supply Gate and walk straight across Route 16. 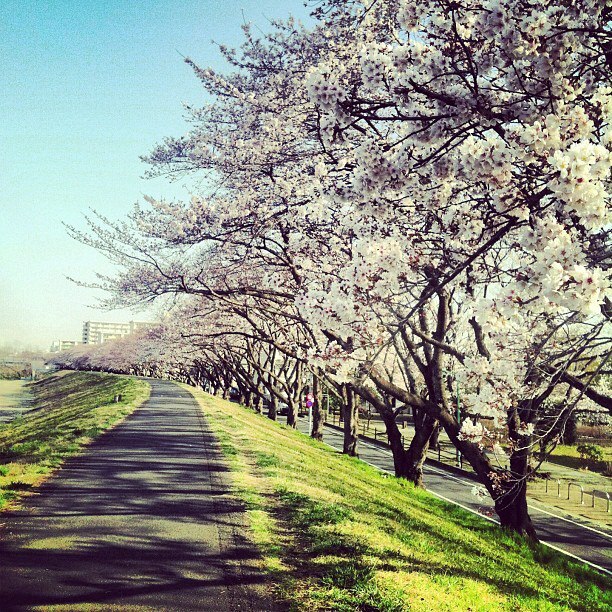 Continue to follow Itsukaichi Kaido Avenue. The entrance to the first site on our tour, the City Tea House, will appear on the second block on the left side of the street. You are looking for a small wooded area with a stone path. Opposite of this wooded area you will see the Civic Center (auditorium), a large red brick building. There is an over-the street walkway to take you from one side to the other. Follow the stone path to see a bamboo fenced area, where you’ll find the City Tea House. (The Tea House is available for rent but you must make reservations 6 months in advance.) Walk around and up the hill past the Tea House, turning right at the top, taking you to the rear of the Fussa Library. 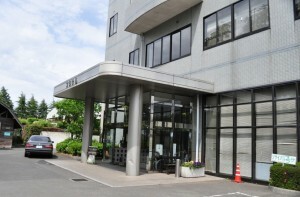 The entrance is around the building to the right, directly behind the Tea House. (The library is open 10am -8pm Tuesday-Friday, 10am – 5pm Sat-Sun, closed Mondays (Tuesdays if Monday is a Japanese holiday; www.city.fussa.tokyo.jp/englishguide/88vtda000000fzsq-att/88vtda000000fzuc.pdf) Next, follow the stone path back to the main street or take a shortcut by taking the path to the left of the Tea House. The next left will lead to a small bridge and waterfall, and an opening in the wall on the right to the library parking lot. 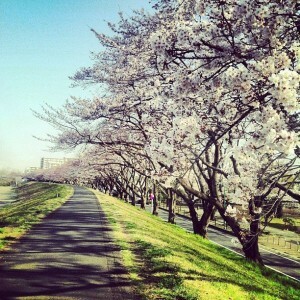 Whether you exit through the parking lot or take the stone path, walk back to the main road Itsukaichi Kaido/Route 7). 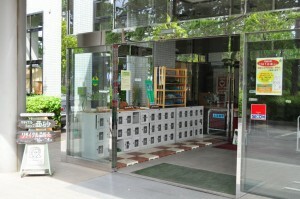 Continue (left) west on the main road (Itsukaichi Kaido Avenue); your first chance to stop for a snack is past the library at the Jonathan’s Restaurant on the left (the same side you should be on). 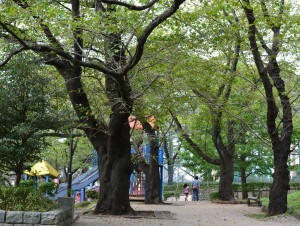 and Meishin-shita Park. The path will end at Mutsumi Bashi Bridge. 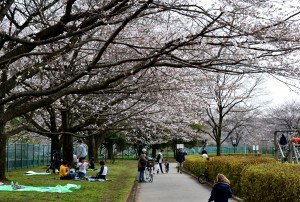 If you go under the bridge you will be at a large picnic area called Minami Park. If you wish to barbecue or play tennis, you will need a permit, obtained in the log cabin park office by the entrance. To continue your walk, exit the park and turn right onto the main street, Mutsumi-bashi Dori; you will be on the right side. The first right will be a diagonal right. 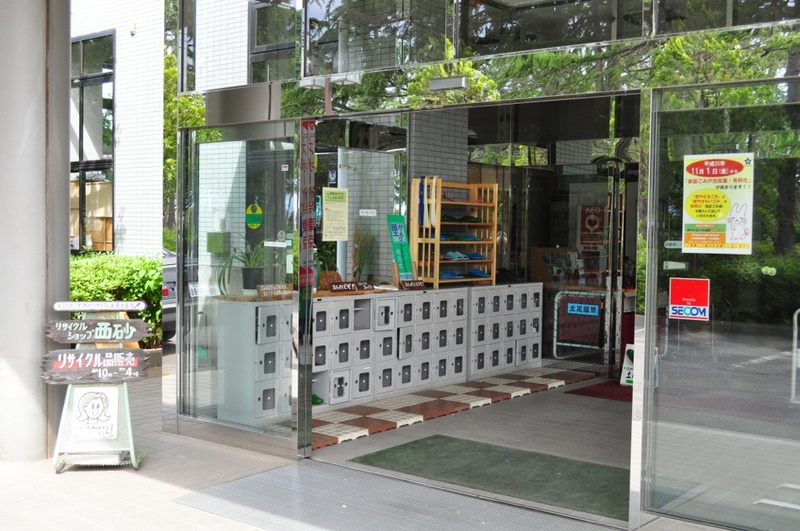 There will be a green sign, an old walking tour sign (8 – Park 9 Temple 10 – Haijima Station). Take a sharp right and follow the road as it winds its way past beautiful homes and the Senjuin Temple.